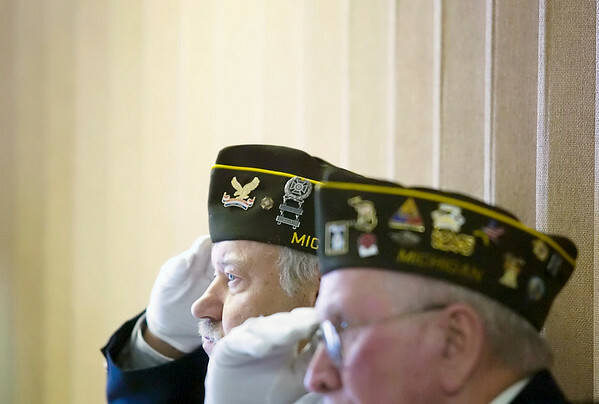 Mike Lempinen, left, and Jim Carlson salute during a memorial service for Edgar Nau at the Traverse City Senior Center. The service featured an honor guard from VFW Post 2780, who performed a memorial flag folding and played taps after friends shared memories of the Marine staff sergeant. Nau, who fought in the Solomon Islands and Guadalcanal in World War II in the 1st Battalion of "Carlson's Raiders," was a daily visitor to the center, a member of the center's grief support group and a regular at the Saturday night dances.